Heritage Society | Sholom - Care. Compassion. Community. The Sholom Foundation Heritage Society was created to honor and recognize the many thoughtful and visionary friends who have included Sholom Foundation in their estate plans. For nearly 100 years, Sholom has made a considerable and meaningful impact on the entire community. As a member of the Sholom Foundation Heritage Society, you are choosing to perpetuate a caring, comfortable and dignified environment for your elderly loved ones in a nurturing Jewish atmosphere. Through your deferred gift, you will leave a legacy that will impact generations well into the future and long after you are gone. Several deferred giving options, such as a charitable gift annuity or charitable trust, can give you a reliable income stream at favorable rates and tax benefits for as long as you live, along with the knowledge that Sholom will receive the balance of this asset upon your death. Hopefully, as each of us reaches an age at which we may require Sholom's services; there will continue to be the programs and facilities of the Sholom Community Alliance to respond to our needs. I encourage those who have already made a provision for Sholom Foundation in their estate plan to let the Foundation know so we can honor you with membership in the Sholom Foundation Heritage Society. And I hope that many more in our community will join our visionary donors by including Sholom Foundation in their estate plans. Members of the Sholom Foundation Heritage Society will be honored and acknowledged in each issue of the Circle of Life newsletter as well as with permanent recognition at both the Norman & Lisette Ackerberg Family Sholom West Campus in St. Louis Park. Have you named Sholom Foundation in your estate plans? Would you like more information about providing a future gift to Sholom and membership in the Sholom Foundation Heritage Society? * Complete the printable Letter of Intent and return to Sholom Foundation, 3610 Phillips Parkway, Minneapolis, MN 55426. 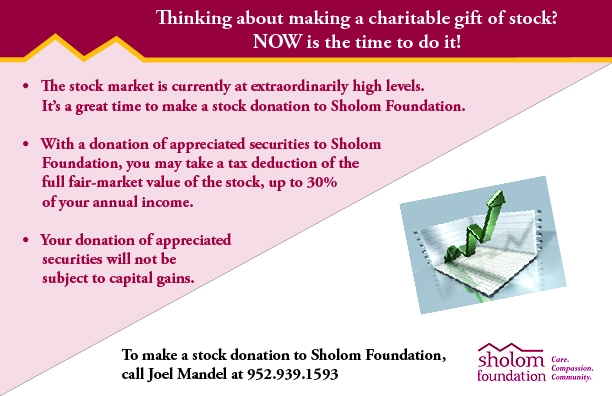 A 501(c) (3) non-profit corporation in Minnesota It would be helpful if you would notify Sholom Foundation of your bequest so you can be acknowledged and honored, and Sholom can plan for the future.